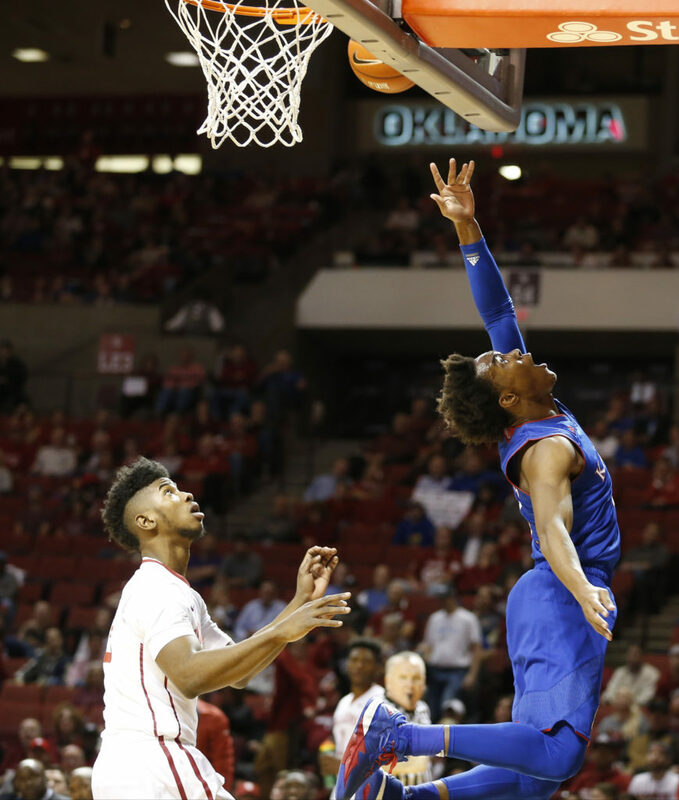 Kansas guard Devonte' Graham (4) gets a shot to drop before Oklahoma guard Christian James (3) during the first half, Tuesday, Jan. 10, 2017 at Lloyd Noble Center in Norman, Okla. 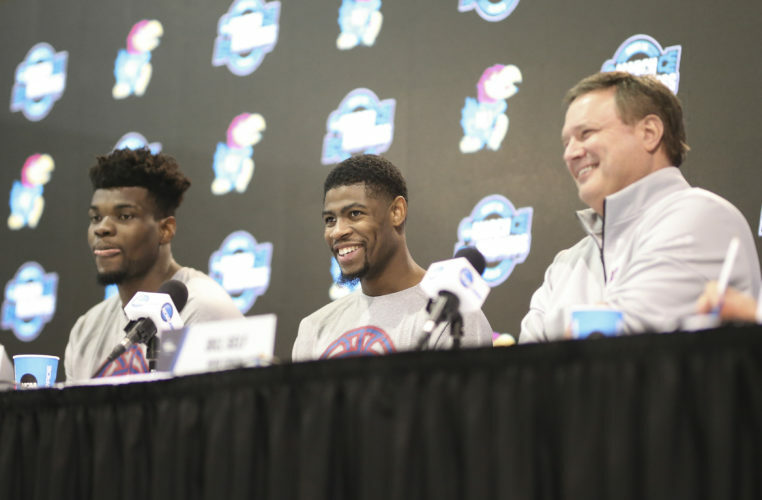 It was no surprise when the Kansas men’s basketball team was a unanimous selection to win the Big 12 in the preseason coaches poll. Bill Self, unable to vote for his own team, cast the only vote against the Jayhawks in early October. 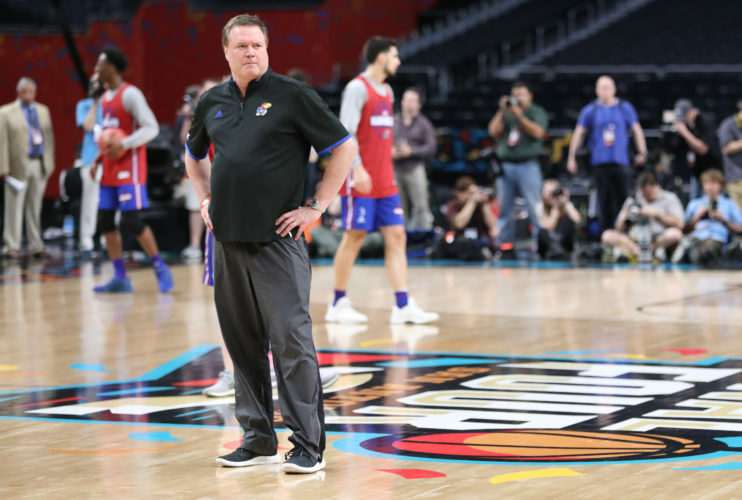 Entering Big 12 play this week, as the Jayhawks aim for their 14th consecutive conference title, West Virginia coach Bob Huggins said he would change his vote if he was given the chance. “I mean if I had to revote, I’d pick Oklahoma right now,” Huggins said on the March Madness 365 podcast with Andy Katz earlier this week. Oklahoma (10-1, ranked No. 12) will open Big 12 play on the road against unbeaten TCU at 1 p.m. Saturday. The Sooners have caught everyone’s attention with sensational freshman point guard Trae Young and their high-flying offense. In non-conference play, the Sooners earned wins over Wichita State, USC, Northwestern and Oregon. Young leads the nation with 28.7 points and 10.4 assists per game. He tied an NCAA record with 22 assists in a win against Northwestern State earlier this month. The 6-foot-2 point guard has scored at least 26 points in his last nine games. That includes a 29-point, 10-assist performance vs. Wichita State in a 91-83 victory. The Shockers had already picked up wins over a pair of Big 12 teams, Oklahoma State and Baylor, giving coach Gregg Marshall a unique look at how Young may look in Big 12 play. In this week’s AP poll, six Big 12 teams are ranked in the Top 25, including four in the top 12. 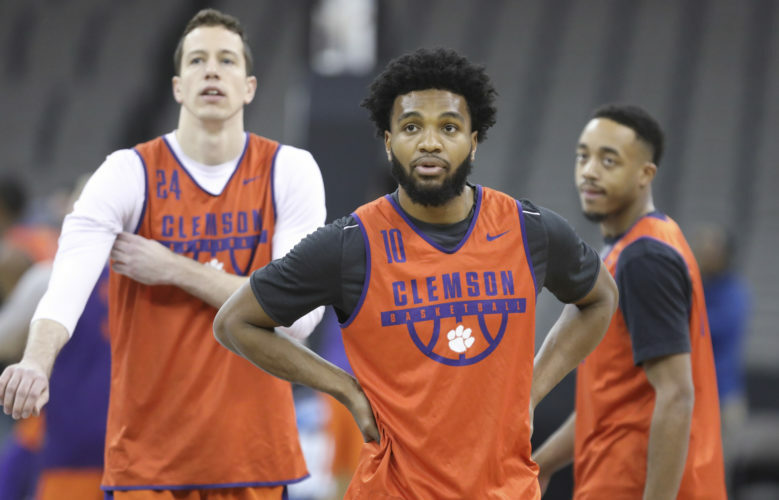 Two more schools are receiving votes, but outside of the Top 25. At the beginning of the season, there was belief that it would be a rebuilding year for most Big 12 schools. Look no further than Oklahoma State, which lost its coach and best player from last year, and posted a 10-2 record entering league action. Before West Virginia’s 85-79 road win over Oklahoma State on Friday, Huggins praised the Cowboys as proof of how strong the Big 12 will look this year.